This is Not The End and You can Accomplish Great Things! →This is Not The End and You can Accomplish Great Things! It hurts. You’ve been working so hard. You’re tired. Will it even pay off? Is it even worth it? I know it’s tough. I know you want to quit sometimes. But this is not the end. Don’t give up hope. All your hard work is going to pay off. Show up every day, and one day you’ll realize — you’ve reached your goal. Eli was born to young parents. 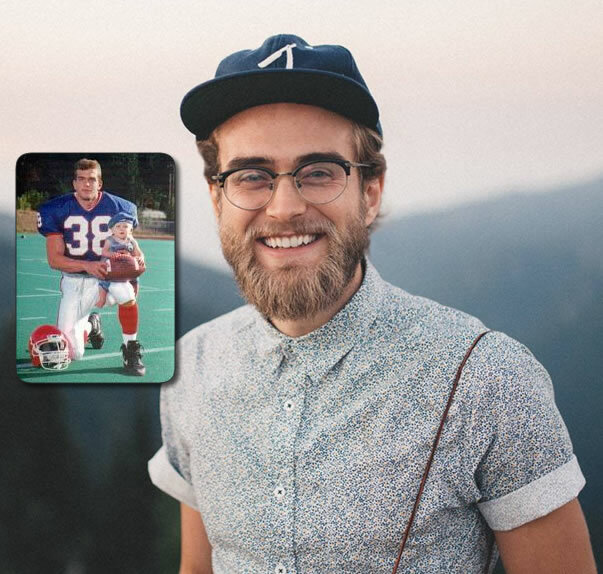 He was in his dad’s high school senior football photos. His parents loved him dearly, but starting a family so young is difficult and faced with many challenges. His parents divorced when he was young. His last year of high school devastated him. He was kicked out of his home, left by his girlfriend, diagnosed with Crohn’s Disease, and deemed medically unqualified to receive a full-ride scholarship that he was previously awarded. It wrecked him. He felt ruined and lost. It was a hard road, but he picked himself up and kept going. Eli has always loved adventure and risk taking. Even when he was a child he liked to go exploring on his own. He loved the thrill of discovering new things. He didn’t like systems, or following the status quo. He was an entrepreneur at a young age. He started in elementary school with things like lemonade stands and selling balloon animals. After high school he tried sales and marketing, but didn’t do very well. Once he realized that he wasn’t very good at selling other people’s products, he tried making some products and services of his own. He started and failed several small business and blogs. Eli is always trying something new and shooting for the stars. Because of this, he’s made lots of mistakes. But he’s learned a lot as well. Throughout all his different crazy ideas and adventures, one thing has stayed the same, Eli loves to tell stories, whether it’s through writing, speaking, or making movies. To read more about Eli’s story, how he overcame impossible odds and followed his dream, click here. You are the master of your ship, you are the author of your fate. What you decide now, determines what will happen later. You have the power to create a future that you’ll love. Happiness and success don’t depend on your circumstances, they depend on your attitude and the actions that you take. Everyone has a dream, even you. You should spend more time doing what you love to do. Isn’t that the point? Comfort will hold you back. Sometime you have to take risks in order to achieve success. Leave your comfort zone. Step out. Experiment. See what happens. There’s never a better time than now. So you might as well start now. The things that hold you back aren’t worth holding onto. Let go of the things that hold you down. It’s worth the sacrifice. Eli’s goal is to help you start your blog or business with a boom. He wants to help you get noticed quick, become an authority in your niche, and make the money you deserve. He loves working with young entrepreneurs, small business owners, artists, and bloggers. Are you starting a blog? Or do you have one already? How would you like to build your blog like a pro without all the headache? Get his FREE Perfect Blogging Toolkit, click here. Every problem is an opportunity. Look for the good in every bad situation. It’s ok to make mistakes. That’s how you learn. Don’t wait for all your problems to go away before you follow your dream. Don’t ever think it’s too late for you. There’s always hope. Anything is possible. You were born for a purpose and are meant to do amazing things. It is story of Eli Seekin full of his courage and hope.He don’t lost his heart try to work in different field.His determination and his aim were very high. Which Helped him to get his goal in spite of many hardship he got his goal and present himself example of live heart man. Thanks for sharing Eli’s story here. He is really a motivation to the young ones. Thanks Enstine. Not only is it great to hear of some one succeeding, but it’s even more motivational when they succeed against the odds like you have. And some one that doesn’t give up, it’s half the battle. Thanks for posting Eli’s Story Enstine! It’s really a motivational post. Enstine, you are really a great person with best heart. I always love to read stories from people that just naturally stand out from the crowd and do adventurous things. I envy a mindstate like that. Like most people, I have to “force” myself to do things out of my comfort zone. You have the perfect attitude, Eli. Oh and by the way, I was afraid of being rejected as a blogger as well. Crazy how our minds deceive us, right? The blogging community is super friendly and I’m glad to say I’ve gained a lot of new friends. This alone is a huge driver. Thank you for sharing your story with us here on Enstine’s blog. Enjoy the rest of your weekend! You are just awesome man. And you did the right things every time putting new posts to motivate the others. I personally feel, you’re just doing the great thing. What Eli stands for has really been a source of motivation for me. One is obviously the master of his ship and ought to steer it towards his own happiness. I do love the motivation in this post. Your story is beautiful and very motivating. The fact that you kept going no matter what came your way, no matter how many failures you’ve had, yo u kept trying. That to me is inspiration. Thanks for sharing your story with us Eli. You landed in the right community here. Did read your story and wish you all the best . Hi Eli, very motivating story! You talked a lot about the problems you faced, and it’s cool to see how much you have overcame, but now we want to hear about your successes! My questions for you are, what are your 3 biggest accomplishments? What problems did you face along the way, and finally how did you end up solving those problems? Most problems that I’ve faced in the last 10 years have all stemmed from being sick. Being sick has made me doubt myself, I’ve lost many jobs because of it, and I’ve felt judged. It’s been hard at times, but I’ve always remembered that there is life after being sick. And I chose to believe that there is more ahead. Things really began to change when I stopped acting that a victim and took responsibility for my own health. I took action. I studied and did research. And completely changed my lifestyle and chose to be proactive about healing my body. Plus I’m only getting started, and I’m extremely excited for the future. I enjoyed reading your entire story here. I knew a few pieces, but I enjoyed learning more about you. I love that you knew from such a young age that the “norm” wasn’t for you. Good for you man, I think knowing what you want and what you’re good at is half the battle. You’re right, it is half the battle. I can’t say that I had it all figured out from the get go. I didn’t always know exactly what I wanted, but I did know what I didn’t want. I am so happy to see you making the rounds my man. From your story to your message of empowerment, you’re on the straight and narrow to getting known in a huge way. Keep rocking it out. Thanks much for the share Enstine and Eli. Signing off from not too sunny NJ. I was honestly scared of being rejected when I first decide to start blogging. But the community and encouragement I have received is amazing and has blown me away. I love your blog and the community here.